If you search your ancestors in Gasperina, Calabria, info about your Italian family are stored in the City Office archives or at the parishes. In towns and villages of Calabria and in Catanzaro province registry offices were established in early 1800: it means that you could find information in Gasperina registrar as of that date. So, if your ancestors were in Gasperina in the nineteenth or twentieth century, then you could try to contact the City Office of Gasperina to know more. 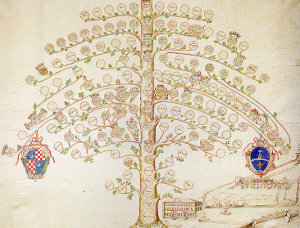 Before to start your genealogy research in Gasperina, we suggest you to read our tips for your search . They are useful to search in Calabria and in Gasperina too. 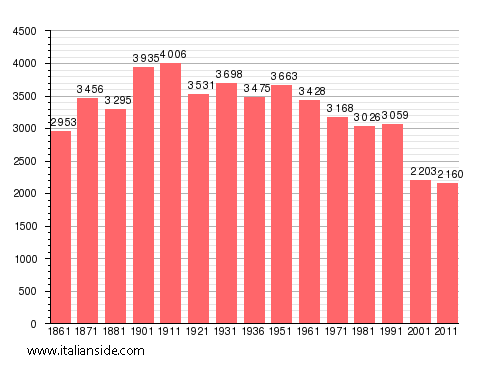 Next picture shows the demographic trends in Gasperina from the Italian Unification (1861) an important info to understand how many people lived there in the past. It could be important to know if the last name you are investigating is a frequent surname in Gasperina. As more your surname is common in Gasperina, as more it could be difficult to find the right info about your ancestors in Gasperina archives if you have not exact dates. Aiello, Bianco, Caruso, Cimino, Colosimo, Cosentino, Critelli, Curcio, De Fazio, Donato, Falvo, Fazio, Folino, Gallo, Gentile, Gigliotti, Grande, Greco, Gualtieri, Leone, Mancuso, Marino, Mastroianni, Mazza, Mazzei, Mercuri, Molinaro, Muraca, Nistico, Paone, Paonessa, Perri, Procopio, Pugliese, Ranieri, Rocca, Rotella, Rotundo, Russo, Sacco, Scalise, Sestito, Talarico, Torchia, Trapasso, Vaccaro, Vescio, Viscomi. Church archives in Catanzaro province may instead contain even older information, but they are far less accessible from abroad (and almost impossible by email). If you have the opportunity to visit Gasperina and Catanzaro province, you could plan to investigate churches’ archives by yourself, but from abroad is very difficult to obtain any result unless you find a reliable local help. Another important source of information are the “Archivio di Stato” (National archive) in Catanzaro e Reggio Calabria. If your research is in a dead end and you need professional help from our local Italian genealogists write to gasperina@italianside.com our expert in Gasperina area will study your request and will reply to you with a research plan and a quote. Looking for information on Michael Parise name in Gasperino might have been Parisi born in 1904. Moved to Boston around 1920 alone . Looking for extended relatives and info regarding his parents. Maria Lamonica June 5, 1901 is my great grandma. She passed away in 1995 and I wish I could ask her more questions about her family. We know her brother died in the war but not much else. Looking for information on Francesco Celia born in the mid to late 1800’s traveled back and fourth from Gasperina to America. His wife in Gasperina had I believe 3 daughters and 3 sons. My father was one of his sons Francesco Paolo Celia married to Elisabetta Grande daughter of Saverio Grande and Maria Teresa Contrambone. Francesco and Elisabetta moved to Massachusetts, USA in 1953-1954 with their daughters Maria and Lucia. I would like whatever information on my grandfather and grandmother their parents and children. Thank you for any assistance you can give me. I am a History student studying United States immigration. I am researching a man called ‘Voci Pasquale’ (or possibly ‘Pasquale Voci’, the name may have been written surname first) who travelled from Gasperina to the United States in 1901. I was wondering what records there may be in Gasperina? It would be great to find out more about him. Any advice or further information appreciated. Hi Katherine, that is actually my great grandfather’s name, and he was from Gasparina. However, he did not emigrate to the United States until about July, 1913. I had heard that the family had traveled to the US in prior years to visit extended family in Boston. Searching for info on Catherine Voci, born about 1842 in Gasparina. She married Bruno Messina, and had some children, including my great grandmother Theresa. I’m looking to research my Fiorentino Family from Gasperina. Giuseppe (born 1903) immigrated in 1921-ish but I am looking for his family there. His father was Francesco and mother Carmela. I know of siblings Caterina, Teresa, Nicola, and Francesco.. but am looking for their records, as well as any of Francesco and Carmela’s. My grandfather was Dominic Carnovale. Born in Gasperina in 1864 and moved to San Nicola di Crissa. He married Filomena Manfredi or Manfrida. She was born in Catanzaro. In 1900 he went to Pennsylvania and she followed 3 years later with Francesco, Nicola Phillipe and Rosa. Having traced my Great Grandfather to Catanzaro I found his birth mother Saveria 26 years old from Gasperina. My Great Grandfather Guiseppe Aloi born 7 October 1867 to Giovanni Aloi 60 years of age from Borgia and Saveria ?Caccia? 26 from Gasperina. Is there any hope of finding records of their birth and marriage? Cristina Procopio Catrambone returned to Italy where she died in 1976. My husband’s Grandfather was Giuseppe Catrambone. He arrived in US in 1905. He left Naples on the Prinzess Irene. Your grandfather, Giuseppe Nicola Catrambone, was born 3-16-1884 and died 9-18-1962. He was the son of Domenico and Maria Gesuzza Barbieri. Domenico was born 4-22-1853 and died 11-26-1895, Maria was born 12-23-1857. I don’t know her death date. Domenico’s father was Vincezo born ca 1819. His mother was Rosa Pastino born ca 1830, Maria’s father was Vincenzo Barbieri born ca 1825 and died 8-16-1883. Her mother was Teresa Carchidi born ca 1830.Vincenzo Barbieri’s parents were Raffaele Barbieri and Teresa Fulginiti. Hope this helps. If you would like to start a research in Gasperina please send your request to gasperina@italianside.com.